Have just updated to 10.04, on a dell inspiron 1501, 2.6.32-21-generic just stops with coloured vertical lines on the screen. Please run the command 'apport-collect BUGNUMBER', which will attach several files we need for debugging. be able to work. I will attempt this a bit later. > just stops with coloured vertical lines on the screen. I have this same issue with my dell 1501. I was able to boot the Lucid 10.04.1 liveCD if I set nomodeset on boot, else I got the lines. I have a Dell Inspiron 1501 that has the same problem under 10.04 and under 10.10. Once the machine is fully up and running, presumably at the login screen but with the vertical bars / stripy pajama effect, if I suspend and resume, the resume comes back with a clean screen at 1280x800. Also, there is a thread in the forums (sorry I don't have the topic to hand) that suggests putting "nomodeset" in the grub boot parameters; for me so far this ensures the machine comes up with a clean screen at 1280x800. Sorry I should have added, I'm happy to test / collect system info if that's useful. I've subscribed to the bug. I can add that Linux Mint 9 suffers the same bug. my ubuntu 10.10 10.04 9.10 fedora14 archlinux(about 1year) have the same bug. Under natty beta-2 this problem seems to have receded. When I started the install, I set "nomodeset" on the boot parameters. The install ran fine, and booting the installed natty from the hard drive, I get no "striped pyjamas". In maverick, a "nomodeset" on the boot parameters worked fine for booting, but I still got "striped pyjamas" on shutdown. In natty, the shutdown experience is as expected, ie no "striped pyjamas". Only really a minor improvement, the main problem still exists i.e. still need nomodeset and then cannot swap to best resolution. > Under natty beta-2 this problem seems to have receded. > When I started the install, I set "nomodeset" on the boot parameters. > drive, I get no "striped pyjamas". > booting, but I still got "striped pyjamas" on shutdown. but on the installed version everything is as it was. Hi everyone, recently I've upgraded linux kernel: Linux isi-mza-nbk-102 2.6.32-35-generic #78-Ubuntu SMP Tue Oct 11 16:11:24 UTC 2011 x86_64 GNU/Linux, and striped screen only appears when booting, at login the screen is normal. Can someone confirm that? I've rebooted 2 times and the same. For me, those are great news! If needed upload some files, just ask. Bad news, I test again after a few hours turn off, and the same problem, striped pyjamas in login window. I will use the same solution: stand-by and wake up. Have you tried NOMODESET as a boot parameter? Yes, I've tried NOMODESET, but in this mode screen resolution is 1280 x 720, and the screen is a little blurry. The optimal resolution is 1280 x 800, and this resolutions is unavailable in NOMODESET. I've just tried the live CD on 11.04 with my Dell Inspiron 1501 and I've had to enable NOMODESET to get it to work without the "striped pyjamas"
I've installed 10.04 and the problem gets worse with each reboot, even though I have nomodeset added in /boot/default/grub on the line: GRUB_CMDLINE_LINUX_DEFAULT="quiet splash nomodeset". After a few reboots, the display only shows vertical lines. 2. You should run "sudo update-grub" after the edits. My 1501 boots without "pyjama phase" doing this. C'est ma façon de parler. I was incorrect: should be "/etc/default/grub", not "/boot/default/grub". I did run "sudo update-grub" after the edit. Because the lines became so bad on my laptop running 10.04, I've done a clean install of 12.04: no vertical lines. I quickly concluded that I hate Unity. So I checked out MATE & Cinnamon. I've settled on MATE. This has made me decide that I'll upgrade on my Desktop to 12.04 with MATE after July, when 12.04.1 is released. Getting this problem again on the 12.10 beta-1 install image; happens prior to the "Try Ubuntu / Install Ubuntu" screen display, so anyone on this hardware trying 12.10 is going to be pretty frustrated. Workaround is to close the lid (suspend) and open it again (unsuspend). From that point on, everything works, including once installed. A bit more info on this matter. With the 3.5 Ubuntu kernel I don't have this problem on the running machine. Trying to solve an unrelated problem, I built and installed a mainline kernel and the striped pyjamas came back. If I boot from the 3.5 Ubuntu kernel, they don't. Today I've installed (new installation) Precise Pangolin (12.04) 64bits in my Dell Inspiron 1501, and the striped coulored lines are gone. I have Raring (13.04) beta 2 installed fresh today and the stripy screen problem is back. Anything I can do to help diagnose the problem? This problem still exists in 13.04 today's iso. I tried setting "nomodeset" when booting the iso but I ended up with bad video anyway. Note that closing the lid and re-opening it returns video to useful mode. Also waking out of screensaver. which shows up on many occasions during the boot process. With today's fresh iso this problem seems to have faded away; at least, the last few reboots (while trying to get my networking working) have not yielded the stripy pyjamas look. frank lovegrove, this bug was reported a while ago and there hasn't been any activity in it recently. We were wondering if this is still an issue? If so, could you please test for this with the latest development release of Ubuntu? ISO images are available from http://cdimage.ubuntu.com/daily-live/current/ . so when I am in the same city as the offending laptop. frank lovegrove, this bug report is being closed due to your last comment https://bugs.launchpad.net/ubuntu/+source/linux/+bug/572521/comments/99 regarding you no longer have the hardware. For future reference you can manage the status of your own bugs by clicking on the current status in the yellow line and then choosing a new status in the revealed drop down box. You can learn more about bug statuses at https://wiki.ubuntu.com/Bugs/Status. Thank you again for taking the time to report this bug and helping to make Ubuntu better. Please submit any future bugs you may find. I was just searching this topic and found this thread, as I have an Inspiron 1501 and was just having this problem trying to install Linux Mint 15. I'm downloading Ubuntu 13.04 now and will try a live USB of that and let you know the results. I'm starting with the standard release, but will also test the development release you linked to above. Not sure I can do all the tracking you asked for, as I'm not a developer, but will see what happens. I tried Ubuntu 13.04 (32bit) live USB, I booted both in 'nomodeset' and 'radeon.modeset=0'. In both cases, it booted to the screen with colored vertical lines. I was able to duplicate the effect of shutting the lid to suspend it, then when I opened and resumed the session the graphics were OK! So that was the standard release, but I will also test the development release you linked to above. Not sure I can do all the tracking you asked for, as I'm not a developer, but will see what happens. > asked for, as I'm not a developer, but will see what happens. Inspiron 1501 and have filed a new bug for it, today. > future bugs you may find. 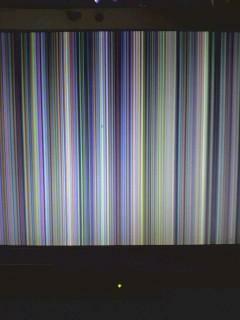 This problem of "vertical coloured lines on bootup dell inspiron 1501" still presents with 14.04. I just upgraded from 12.04 to 14.04, in the upgrade process the fix of adding radeon.nomodestet=1 at grub bootline got lost, and the vertical colored stripes came back when booting up. However, it seems that it seems it happened not as often. I wish that the problem could be fixed. My laptop is a Dell INspiron 1501. I read in the list that it has related to Unity? Is it true?